Sitting in the claustrophobic corner of our van, also known as the back seat, I’m struggling to keep my dinner down. We stopped some time earlier at Levin, where I visited one of my favourite feeds for Friday nights, Thai Taste Express. Very unusually, I couldn’t even get through all my dinner. I have a theory that a lack of sleep over the past few days has played badly with my system, and it would also explain my headache. Most vans aren’t made for a nice back-seat experience, especially not on windy unsealed country roads. We’re aiming for possums every couple of minutes though, so hopefully something good is coming out of it for New Zealand. Eventually we’re at the end of Renfrew Road below Rangiwahia. Stepping outside, into the rain, I suddenly feel much more able. The fresh air certainly helps. 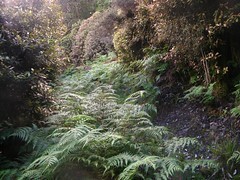 Location: Ruahine Forest Park, Rangiwahia Road-end. People: Alistair, Hans, Mika, Pete, Bernie and me. 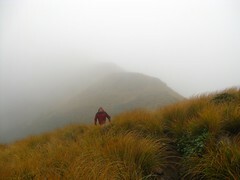 Route: Walk up to Rangiwahia, go for a wander around the tops, then down Dead Man’s Track. 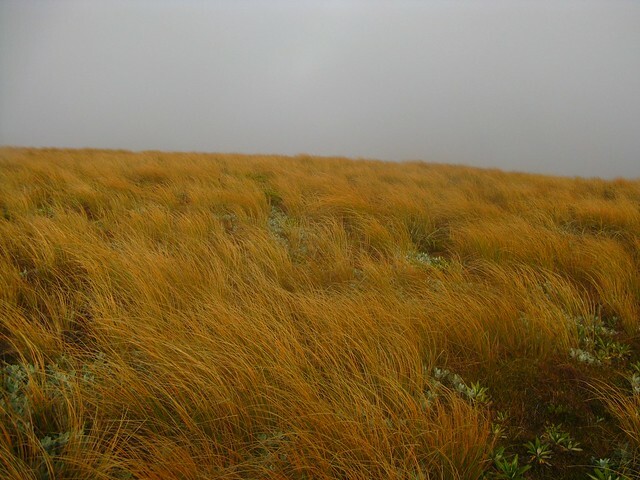 It’s about a quarter past ten in the evening when we begin our walk up by torchlight, and will be a further hour and forty minutes before we reach Rangiwahia Hut, situated just over the bush-line at 1300 metres above sea level. Along the way, I notice that what was by far one of the Department of Conservation’s best ever signs (the “Worst Is Over” sign that used to decorate the top of the detour around the major slip) has disappeared, either removed or taken by someone who wanted a souvenir. Near our destination, I begin to feel queasy again which may not be a good sign. We arrive, however, and the only occupant on this Friday evening is the one person we were expecting to find, who’d driven down from Tauranga to join a trip that Sam was organising, and this helpfully means we don’t need to be as discrete when settling in. Sam and two others plan to head over to Howletts tomorrow, which is more than the rest of us will probably be bothered with. Alistair had an idea that if Saturday was perfect, we might drop packs and coast around the tops on a daywalk over Te Hekenga, Sawtooth, down into the valley and then up to Pourangaki, then back to Rangiwahia. Alistair calls this idea a “womble over the tops”, which translates to meaning whatever we feel like doing at the time. It would be extraordinarily optimistic. As the rain continues to splatter on the roof, which (by the way) is consistent with the heavy rain warnings for the weekend, it seems extraordinarily unlikely. I packed a big fat hard-cover library book before I left home. It’s great to get out again, though. For me, this is the first time for a couple of months — the first time back to the Ruahines for over a year, and I’ve missed it. Early, but not too early, on Saturday morning, Sam and his two chums awake and rattle around. From what I can see of the light shining through the windows, it’s still fairly yuck outside. Being able to just lie here for a change, without concern about getting up to leave, is actually quite nice. I find my book and browse a few pages, and meanwhile Sam figures out the exact plan so we’ll know where to collect them tomorrow afternoon. They’ll be coming somewhere off Toka and meeting us at a car-park down that way at 3pm, which should give us plenty of time. They leave, which is motivation to finally rub my eyes and slink off the mattress under the window, then search for my breakfast which has been hanging up (away from rats) since last night. I’m feeling much better now. The sleep seems to have helped a lot. and Pete ready to go. Nobody really feels like going as far as Manugahuia. At one point the wind might be picking up, but it nevertheless withholds itself from the full unchallengeable force of which it’s capable in this sort of area. We just want to get outside to do something, and can easily make up stories to impress others later on if it seems appropriate. Spot-height 1635 is a more enticing target, but not until we’ve already gone past the most direct way to the top, which is straight up a spur off the track fairly early on. Instead we begin with several minutes of clambering up a combination of scree and tussock, but eventually manage to intersect with the spur and from there things are much easier. 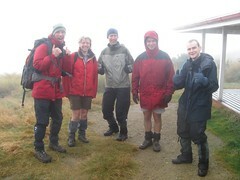 At a quarter to eleven, roughly two hours after we left the hut, we stand on the anti-climatic top of spot-height 1635. It’s rather flat, actually. 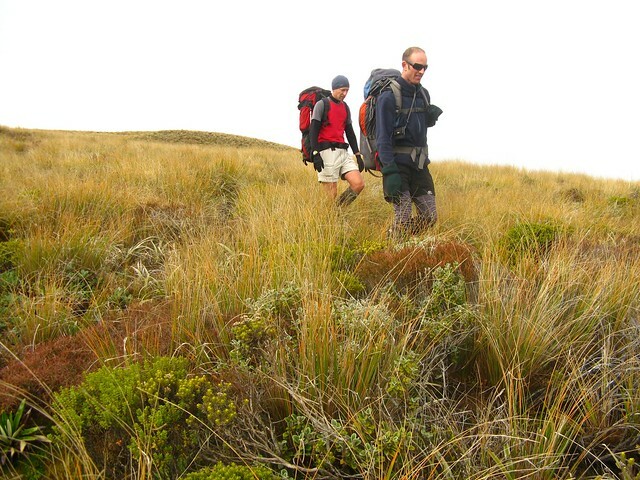 Hans and I both spend a short while trying to find the highest patch of tussock that wouldn’t sink into the earth when we stand on it. From the map it looks as if it’s possible to follow the north-west facing spur (not the west-facing spur!) from here down to a track into the bush-line, ending at a road called Titirangi Road that I’ve never visited. Following down to the end of a dead-end road doesn’t appeal to any of us, however. 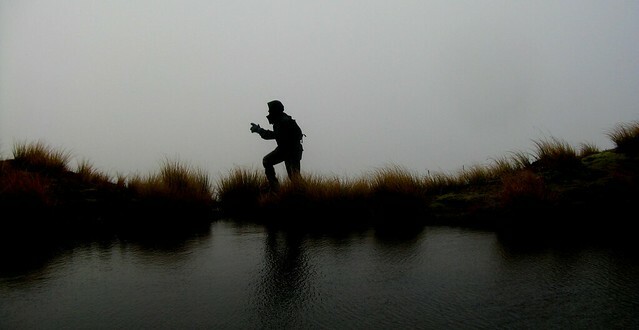 Pete behind one of the many tarns in this area. Watching the wind blast the saddle below 1635. It’s overcast, reasonably windy and with recurring rain. Looming sunshine threatens very occasionally as infrequent gaps open up, but always submits. I like this kind of weather, and especially on the tops. 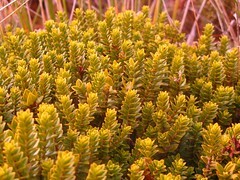 It brings out the reddish colour in the alpine tussock that isn’t nearly as apparent in simple sunshine. There’s also a nice appreciation of the environment and how animated it can be. It’s pretty cool. 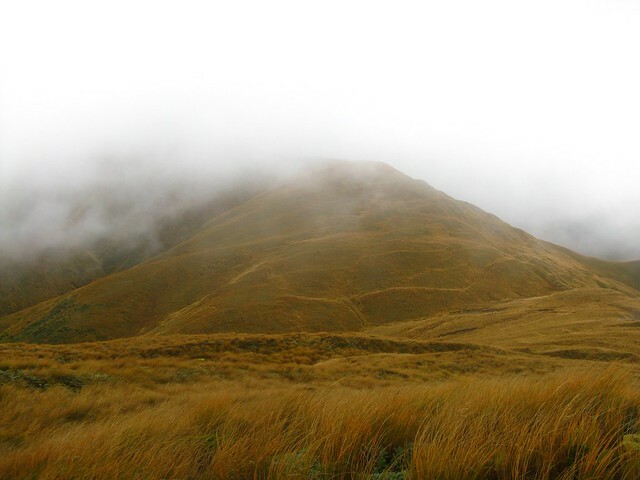 We turn back the way we came, towards Rangiwahia Hut, stopping to admire the tarns and the tussock and the wind-whipped clouds as they blow around us and over the range. It’s nearly lunch time, and thirty minutes short of Rangiwahia Hut the horizontal southerly hail sets in. At this point I begin to regret having left my legs exposed as they start to get a mild hammering. Perhaps it wouldn’t have been such a bad idea to have worn those long-johns after all, but I don’t especially feel like stopping right now to sort out that kind of thing. Surely the ditch will protect my legs. Rangiwahia Hut remains empty when we return, but it’s literally within a couple of minutes that an Australian (though whom we later discover lives in Palmerston North) by the name of Nicola pops her head in the door. She’s just walked up over the slip from the road. It’s her birthday tomorrow. Lunch time. We laze around the hut all afternoon. 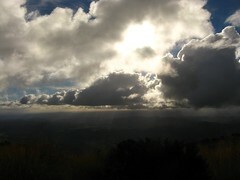 Rangiwahia Hut is warm compared with the freezing conditions outside, although the clouds give way from time to time to reveal a pathetically ineffective sun. As time goes on the hut’s transitory population reaches thirteen, and then fourteen happy people as the sun sets. A few will probably be on the floor this evening. Hans and Mika produce some kind of travel Monopoly, but it’s not really Monopoly except in name. It looks more like Yahtzee with tiny green houses. 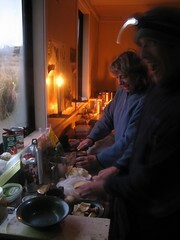 As time goes on, people begin preparing their dinner. Mika and Bernie help Alistair prepare. Alistair enjoys cooking. If he coordinates a trip with twelve hour days, you can be sure you’ll be carrying lots of good food to go with it. This trip was always likely to be cruisy by comparison, and tonight he’s complemented us with a menu we can boast about. 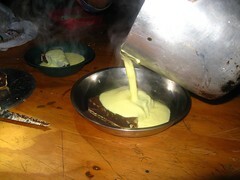 A curry that’s simmered for about an hour and rice to go with it, some kind of giant chocolate thing and a giant slurry of custard. Bernie, Hans and Mika help him out, and it seems Pete and I will be on dishes tonight. As we sit to eat, another three people, this time cheerful hunters, roll up through the door in search of a night’s accommodation. Their first order of business is to figure out where to sleep. I offer them my second hand thin three-quarter length thermarest that I bought off Trademe some years ago. Alistair is a culinary genius. So, the hut contains six of us, an Australian named Nicola, two young couples, an Auckland man and his young and enthusiastically talkative son (who presently engrosses Mika’s attention with the detailed description of how to play a game that involves shaking tiny plastic animals to see which stands longest), an American backpacker who walked in as I was taking photos of the sunset, and three fairly big guys with grunty looking guns. One of them is busy explaining to another about something to do with being able to attach a camera to his scope. Pete and I go outside with a map and compass and argue about which sets of lights are Mangaweka and Ohingaiti. Somewhere along the line we get most of the dishes done, and eventually I’m my sleeping bag and reading. Time goes on and the lights go out. I’m lying in bed half awake as the three hunters, around the corner from where I lie, quietly pack their things and leave. It’s still dark outside, and I drift back to sleep for an uncertain amount of time. My next memory is the sight of Alistair, on the top bunk opposite, reading his book with a torch. Some light enters the window, and I collect my things to crawl out of bed. I find my thermarest standing against a wall, and pull it back with my things. Others are stirring now, too. On Sunday morning it’s still freezing outside, but the sky is clear. The sun glints near the horizon, provoking early morning refractions in the condensation on the window, and on stepping outside it forms patterns through the frosty icicles that cover our outdoor surrounds. The slopes of Ruapehu mostly hide under cloud in the distance, fronted by the township of Taihape. We boil a billy full of water, and as we’ll be leaving properly today I begin packing up as I wait. It’s hard to get used to this lack of need to leave early. I look up and see Alistair still lying in his sleeping bag, perusing his book. I tell him there’s hot water when he wants it, and he says thanks. Meanwhile everyone is stirring, and the atmosphere of a crowded but reasonably spacious hut is becoming less dormant. It’s the last day of a weekend, and everyone is preparing to leave. Having downed my ad-hoc porridge, I return to sit on my bunk, and examine my feet. The tape that I’d put over my little toe yesterday isn’t sitting quite right. I pull it off, and the whole nail comes with it. Grrrr. That one’s been loose for a while, I suppose, but hopefully it’ll seal over sooner or later. A band-aid will have to do for now, to be held together within a few minutes with wet socks. Yeah, wet socks. Others optimistically dry their socks in front of Rangiwahia’s sophisticated gas heating system. Actually, it was happening last night and there have been endless streams of steam vapourising from in front of that heater. It’s nine am when we leave, having taken a some time for everything to become organised. The hut’s been swept out (such that I now feel guilty for having stood around outside all this time), and virtually everyone else has either left or is standing outside. I think I pulled my wet socks and boots on a little too early. Despite the luke-warmth from the sun, still low in the autumn sky, I’ve now been standing outside in the frosty grass for ten minutes. My feet are solid frozen bricks, and it’s not very comfortable. Hans points out that I can stand at the end of the hut, which due to its upright orientation has absorbed some of the heat more directly, but there’s still no way the warmth is getting inside my boots. Actually walking somewhere, as we finally leave, quickly nulls the pain. My feet are soon warmed by their own traction, as is usual. We follow the same ditch we followed yesterday, this time carrying a little more. So far we only have a loose plan of going for another wander around the tops, then returning to the van via Dead Man’s Track. Nicola, the Australian woman whose birthday it is today, heard we planned to go down Dead Man’s and asked if she could hitch along, not being too confident about going that way on her own. She left a while before us, but might wait somewhere up the track. a dusting of snow overnight. Despite the sun still being low in the sky, and not yet very warming, prospects of a sunny day seem quite good. The sky is mostly clear, for one thing. It’s been a cold night, however, as demonstrated by the frost that covers everything. Crystals of ice have formed over the puddles in the ditch we now walk through, making an interesting light show for anyone prepared to get down for a look. Nicola is waiting at the junction with Dead Man’s when we arrive, and with a quick poll we discover that nobody really feels much like dropping packs and going for another walk. We’d rather see what Dead Man’s Track is like, and take our time with it, so Nicola comes down with us. The ground is quite muddy. Dead Man’s Track is a very nice route. 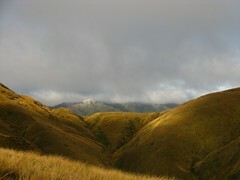 It begins with a gentle climb up Mangahuia, and then we weave around down into a saddle to the west, covered in tussock with occasional obscured holes in the ground, and also full of mud. Once out of the saddle, it’s a gentle and long descent in a westerly direction. I don’t know specifically why this track is called Dead Man’s, unless it has something to do with the chainsaw massacre that must have taken place to cut through such a long line of Leatherwood — the scourge of a lost tramper in the Ruahines. With the day becoming increasingly bright and warm as the sun lifts its elevation, the walk slowly down-hill surrounded by such a landscape makes this entire weekend worth it. through the Ruahines’ Leatherwood Belt. Along the way, we pass a couple of very nice campsites. I think that next time I come here, if it’s a nice evening, I might prefer to walk up Dead Man’s and camp rather than walk to Rangiwahia Hut. I heard a rumour a few years back that there are informal plans to move Rangiwahia Hut and make it more accessible to Dead Man’s Track, especially with the problems of the large land-slip on the other track. If this ever happens, there are at least a couple of very nice potential sites for a hut. Somewhere along the way, Nicola and I stop to wait for others to catch up. During the five or so minutes of quietly standing there, a Tomtit hops down from the trees and flutters around me for a minute or so. I think it just wants to see who I was, and as soon as its interest is satisfied, it flies away. It’s about lunch time when we finally emerge from Dead Man’s Track, almost immediately at the parking area. What a nice cruisy weekend. We have some time to kill before collecting Sam and the rest of his trio from somewhere below Toka (near the Heritage road-end), so go for a drive to a place called Apiti. Apiti has a golf course which, from the road, looks as if it’s spread over flat sheep paddocks. Each hole is fenced to prevent the sheep from messing it up too much. The guy at the pub enthusiastically tells us how the Apiti Golf Club has a membership of about four hundred, about twenty of whom are active locals but most of whom are from Auckland and who have never visited Apiti. Supposedly the $80 annual fee makes it the cheapest way to stay affiliated with whatever New Zealand golfing body it is that lets them play on all the rich and swanky Auckland courses. Apiti’s a nice place, an alternative to the good pub/cafe at Kimbolton that’s helpful to remember, and a good place to wind down a nice weekend. 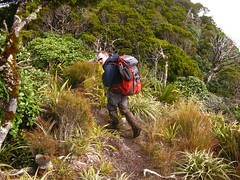 This entry was posted in tramping and tagged bagged:rangiwahia hut, ruahines, tramping, wellington tramping and mountaineering club. Bookmark the permalink. Hey thanks for the nice feedback. And wow, New Zealand’s a small country I guess, or at least the outdoor community seems to be at times. Of the two of us outside on Saturday night, I was guy getting confused about my compass. Remembering that Taihape existed would have helped figure out the lights. I hope you both enjoyed yourselves. It’s great seeing children out and having a good time. 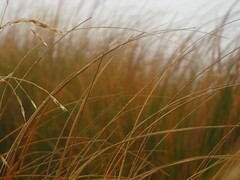 Great story, even more relaxing to read it than when cruisily walking through the tussock. This reading makes up for the fact we didn’t take any books. Also thanks to Jude and John for their company. 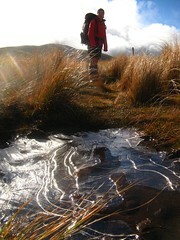 Always great to read about the Ruahine, especially when I am unable to get out there myself. I recall walking Deadman’s when returning solo from Triangle some years back, and found it difficult as it was cloudy and at that time unmarked. It is easy to forget how big it is up there. It was good to get to the end of that spur and the forest. You are right though, lots of room to camp up there, and that is the alternative plan (moving the hut), should Rangi track disintegrate to the point it can no longer be traveled. Which is only another large slip or two away. Hi Robb. From what I’ve read you seem to be on track for getting back out there before too long. With any luck it’ll be sooner than you expect. Maybe it was just the sunny conditions, but I found Dead Man’s one of my more favourite walks along a spur. I can imagine it being far more hostile though, especially in the higher sections. Me my wife and our 2 kids lived in pioneer cottage on roger woods property just below the leatherwood/tussock grass not too far away from rangi-hut, from about 1983-6, 7 were we survived by hunting possums, helping in the woolsheds og roger woods and steve belski , along with selling my art-work to local farmers during the close season. etc. I know that area like the back of my hand! The Mist and gales coming down the gorge and into our wee cottage/chuckhouse/pigsty was some experience!! Yes! I miss rangi something rotten! I wish I could live there now! Wow, that’s some experience, Paul. I bet I don’t know the property but I can imagine it. Yes I really enjoy the misty tops experience, and I’m missing it now that I’m stuck in Australia for a while. Definitely looking forward to figuring out how to shift back home, hopefully one day if we can ever sort out the employment issues. Mike. Hi, again, and thanks for your very kind reply. I’m sure that one day you will get the kind of employment which will make you very happy. All the best for the rest of your life and your own!